There are areas in the country where heating systems are already being fired up and are running quite regularly. Here in Florida, this obviously is not the case. Our air conditioning systems are still the stars of the show, as they are throughout most of the year. That is why, even this late in the calendar year, you really need to be tuned into your air conditioning system and the way in which it is operating. Those “minor” issues that you’re noticing are almost certainly more serious than you realize. And, when you live in as hot a climate as we do, any air conditioning issues are cause for serious concern! We don’t care what the date on the calendar may be—AC problems always demand prompt AC repair in Tampa, FL. We are using today’s post to fill you in on some of the common warning signs that your air conditioning system may be in trouble. One of the problems with diagnosing an ailing air conditioner is the same as dealing with a sick pet or baby—they just can’t tell us where it hurts! 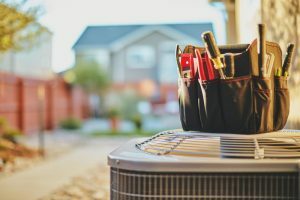 Not to equate your air conditioner with a loved one, of course, but the fact remains that there is no clear communication to be had when it comes to developing problems. This does not mean that your AC is not trying to tell you something, though. If your air conditioner starts making a strange new sound—grinding, screeching, nonstop clicking, etc.—or if it is just operating much more loudly than is usual, it is telling you that something is wrong. It may not be a huge problem, but it could be. Regardless, the only person capable of diagnosing a problem accurately once such symptoms develop is an experienced, professional HVAC technician. This is, with the exception of an air conditioner that won’t start up at all, the most obvious sign that there is something wrong with your AC. Remember, it doesn’t need to be blowing hot air to start raising red flags, just air that is not as comfortably cool as your accustomed to. Anything from leaky ducts to dirty filters, filthy coils, or even a low refrigerant charge due to leaks could cause this problem. Here’s a bit of advice before you go calling in the cavalry, though. Double check your thermostat to make sure that everything is set properly. You may have a heat pump that got switched over to its heating mode. The system may also be set to fan-only. You don’t need a professional technician just to reset your thermostat. This is called short cycling and, yes, it is a serious problem. The cause of the problem may not be—dirty filter, faulty run capacitor in need of replacement—but it could be—refrigerant leak putting the entire system at risk! Your AC should not be running around the clock. However, it also should not be starting and stopping in rapid succession. If you notice any of these problems with your HVAC system, make sure that you schedule service with the qualified pros on our team right away. Contact Bayonet Plumbing, Heating & Air Conditioning at the first sign of AC trouble!